I'm so sorry, guys. I'm so angry I've let BEDA down, but it's certainly not been through lack of trying. The great part is that I've had an amazing few days with some awesome people, but the downside of that is I've had absolutely no way of blogging about it! I wasn't at a PC at all yesterday, and the day before I was so busy writing up a big entry for the UK PonyCon forums that by the time I finished at 3 am I was just absolutely ready to drop. However, I'll make up for it now. The past few days have been amazingly fun. After work on Sunday I took a train up to London to stay over with Moose for the night. The next day I was due to meet my friends (and PonyCon team mates) Archer, Jess and Laura in Waterloo, where we'd mooch around for the day, having a good time and promoting UK PonyCon along the way. We went around Southbank, had a ride on the carousel (like grownups do) and met a couple of really familiar faces. Not letting a golden opportunity pass, we snapped this fantastic shot of Pinkie Pie meeting a certain Sith Lord. After that, and after a little chat with Jack Sparrow, we grabbed food and headed over to the Trocadero, a mecca for students and kids who have too much money to waste on arcade games and anime paraphernalia. We had a go on a camel derby, which is basically one of those silly 'throw balls in the holes and make your camel get to the finish line' games, and I won a bunch of tickets! ...which sadly only won me a plastic 'winner' medal and a tiny notepad. Oh well! After that, we grabbed a drink at Ed's Diner, a place Moose and I discovered last year which serves amazing floats and chilli dogs. We drank our weight in milkshakes and Cherry Coke floats and headed outside, where the glorious sunshine magically (and rather instantly) transformed into a bit of a mini typhoon. 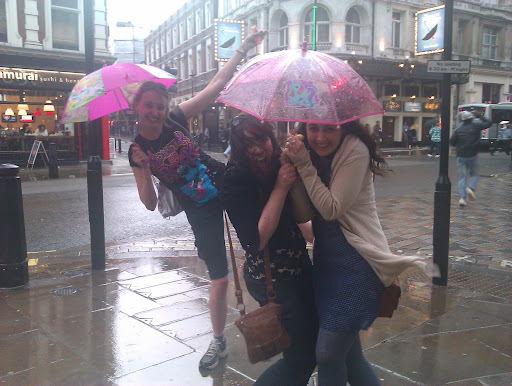 Yay for British weather! So where better to go when it's pouring down outside? The Rainforest Cafe, of course! I've always, always wanted to grab food in the Rainforest Cafe, but it's a bit expensive so we usually just soak up the atmosphere of the shop and leave for cheaper climes. However, today we decided to go wild and treat ourselves, and I gotta say it's worth the expense, really! The atmosphere there is amazing. It's literally the closest I've felt to Disney without actually being there. There was fake rain, there were animatronic elephants, snakes and gorillas, the atmosphere was just amazing. The whole meal was made even better for the fact that Laura is terrified of people in mascot costumes for some reason, and Cha Cha the Tree Frog took a liking to our table and stayed with us for a while, playing with some of our My Little Pony toys, haha. She was literally crying by the time he left. Mean and horrible it might well make me, but I recorded every moment. Once we escaped the clutches of Cha Cha and his evil mascot doings, it was time to go camp it up bigtime at Priscilla Queen of the Desert! Laura's recommendation! I absolutely loved it! It was a complete spectacle, from start to finish. Bright lights, glitter, gorgeous songs, genuinely funny most of the time, and just plain fun fun fun. Laura suggested we go see it, and I'm so so glad we did. Thanks to her mad contacts in the theatre business, we got killer seats at a stupidly cheap price, it was awesome! After that we were all just so exhausted, not to mention freezing cold, so we grabbed fries at McDonalds and headed back to Laura's place, where we continued, despite being completely exhausted, to slumber-party it up until the very, very late early hours, haha. It's SO much fun isn't it? I'd LOVE to catch it again sometime, because the whole thing had me grinning like an idiot. Like I said, a proper show and god, those cupcakes! Though it was the stupid paintbrush dresses that did it for me, hahaha.